Seaview Rainbow is located next to Laem Sri Thanu the rocky peninsula that lies between Ao Hin Kong and Ao Sri Thanu. 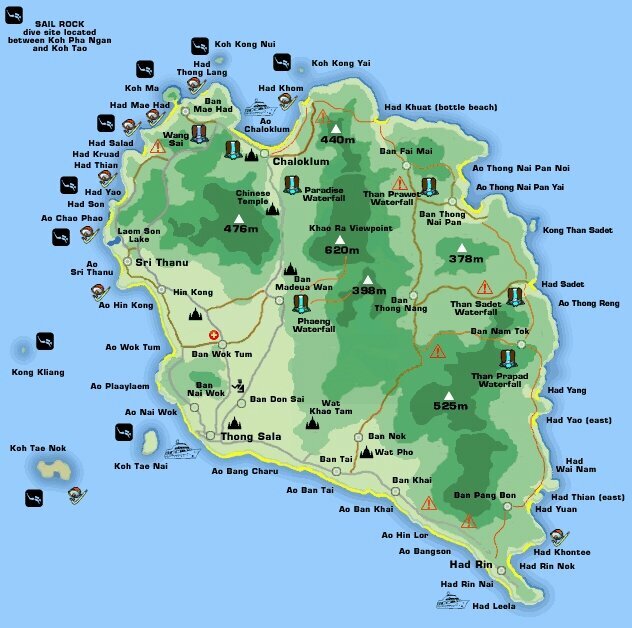 Located down the road from Ban Sri Thanu, the market centre for the west and north-west coast of Koh Pha Ngan. Located at the west end of Ao Sri Thanu, the village is the area’s very tranquil main fishing port populated by smaller squid fishing boats and longtail boats. In the village there are two main centres, by the port – where there are internet facilities, a couple of snooker halls, and some inexpensive farang friendly restaurants with satellite TVs, Thai noodle stalls, street side restaurants that serve up very tasty local food at great prices. There is also a couple of Karaoke bars and some fruit and vegetable market stalls nearby.